The photo speaks for itself — and speaks about a DOT employee who should probably be reassigned. Sort of speaks for itself, doesn't it? Photo: Scott Knobler. Streetsblog has covered taxis in bike lanes. It has covered cops in bike lanes. It has covered drivers doing a lot of crazy stuff. But the picture above takes away the breath of even the most-jaded activists. Yes, this is a Vision Zero van parked in a bike lane. 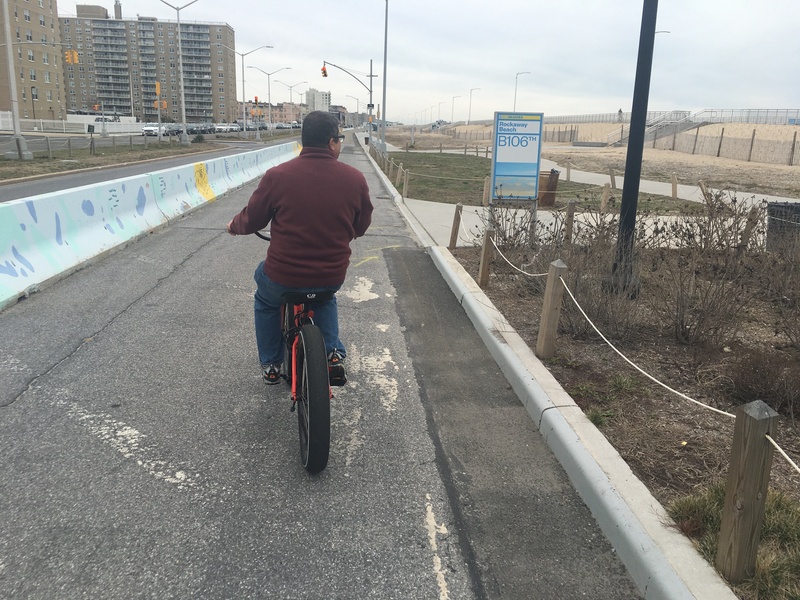 The photo was taken by new Streetsblog hero Scott Knobler on Saturday in the Rockaways. There’s really not much more you can say about it: It’s a picture of a van promoting Mayor de Blasio’s goal of protecting cyclists and pedestrians … by putting cyclists at risk by making them maneuver into the car lane or putting pedestrians at risk by forcing cyclists onto the sidewalk. The photo speaks for itself — and speaks about a city Department of Transportation employee who should probably be reassigned. But I asked Knobler to provide some details because, you never know, maybe there were extenuating circumstances to exonerate the van driver. “I was mocked and laughed at when I questioned why they were parking there,” Knobler, who posts on Reddit as KingNeptuna, told Streetsblog, repeating a sentiment cyclists know rather well. Yeah, well, sure, but one thing at a time. I reached out to the DOT and the NYPD’s 100th Precinct to see if the van driver was fired or at least ticketed, and I’ll update the story if I hear back. While this van was at the location for the unloading of equipment and materials provided by Vision Zero safety street teams, it should not have been there. We will be mindful of vehicle placement at such events and the appropriate unit addressed this matter with the driver. Bike lanes need to be grade-separated from the car/parking lanes. This is hilarious!!! Do you mean grade-separated like the sidewalk level in the above photo – on which there’s an NYPD van parked? Properly designed streets are part of the equation of Vision Zero, but driver etiquette is another part. I would think those DOT employees in the van would at least be apologetic about it and explain the reason why they had to block the bike lane (that their own agency designed and installed, based on studies done by their own agency, and in response to the safety need for it that their own agency determined existed). At the current rate that we’re going, I think we can pretty much guarantee that by 2020 at the absolute latest, the NYPD will be handing out $225 “Distracted Walking” tickets to pedestrians for wearing headphones while crossing the street, and touting it as a “Vision Zero” initiative. Either that or beating cyclists – and then ticketing them. Bikers are the last group of people left that it’s okay to hate. If only the tickets were that lenient. Montclair, CA charges over $500 for that privilege on the third and subsequent offense. Agree, but at least the van parked at sidewalk level is not parked IN the sidewalk area. From that respect I’d say he (NYPD van) is being courteous. Whether the other two vehicles would be so courteous if the bike lane were elevated to the sidewalk level in this photo remains to be seen. A cyclist was struck and killed on Borden Avenue in Long Island City on Thursday morning — on a stretch of roadway where locals demanded more protection for bicyclists and pedestrians.